Like most guitar players, you probably spend a lot of money investing into high quality guitar strings, but sadly, the crisp bell tones that come from new guitar strings is short lived. The short life span of the gorgeous tones your strings produces is mostly caused by lack of a proper cleaning procedure, but excessive humidity and naturally acidic sweat can also play a part in the altering of your tone. Naturally acidic sweat and excessive sweating causes the alloys that are using in the manufacturing process of your strings to oxidize which results in the sound of blunt and dull sound, not the bright, ringing sound that you get when you install a new set of strings on your instrument. A lot of musicians have unrealistic expectations on how long their strings should last, but a lot of manufacturers suggest that you should change your strings out to a new pair after four to ten hours of playing. In other words, if you happen to be a guitarist who plays your instrument every day, you should be changing your strings every week. In the long run, this can become very expensive, because a new pack of strings can run you between $7 to $12. There are some musicians who enjoy the sound of older, flat strings, which is perfectly okay! There are some guitars out there who happen to only sound at their best with a fresh set of strings on them. In my personal experience of playing guitar, newer guitars tend to sound the best with new strings, because new guitars are ‘stiffer’ and haven’t had the ‘played in’ experience that older guitars tend to have. On new guitars, a fresh set of strings really help to project the sound you’re producing. A lot of older guitars have great sound, even when playing on older strings, simply because they’ve been played with and ‘used’ for a period of time. If you’re not really worried about having to replace your strings on a weekly/bi-weekly schedule, it’s still highly recommended that you clean your guitar strings. Before playing, apply a quarter sized drop of hand sanitizier on your hands and rub you rhands together. The hand sanitizer will kill off the bacteria that’s on your fingers and palms, but it will also remove the harmful oils on your hands that can damage your strings. You can buy a bottle of hand sanitizer at your local drugstore, WalMart, or dollar tree. Using hand sanitizer over washing your hands with soap and water is much more effective at killing off bacteria, but constantly washing your hands with warm water will soften the calluses on your hands and fingers, which may make playing a bit more unnerving on your hands than normal. When you’re finished playing your instrument, wipe the strings of your instrument down with a dish towel or a dry cloth. Make sure that you’re wrapping the cloth around the strings and follow the length of the strings with the cloth. You should expect to see the dirt appear on the towel when you’re done cleaning your instrument’s strings. Even if you don’t happen to have a problem playing on dead strings, you are most likely going to experience problems with tuning. When you play strings for a long period of time, the strings wear down as they mash against the frets of the guitar. If you have noticed that your guitar doesn’t seem to stay in in tune, try changing out your strings and you may find that the tuning problems will go away! The first step you’re going to take to clean your guitar strings is to properly position your guitar to prepare to clean your strings. Free up your hands to do all of the cleaning work by resting your guitar on its back, on a flat surface, like a table, floor, or desk. Make sure that the head of your guitar isn’t touching anything, as this will ensure that your tuning pegs don’t become damaged in the cleaning process. Have a cleaning solution and a cloth or a rag ready to clean your strings. There are some people who prefer to use a paper towel, a dry dish towel, a clean cloth diaper, or a microfiber cloth. Any cloth or paper product will work for your purposes, but you do want to make sure that it’s a clean, dry, and soft cloth. When using a cleaning solution, make sure that you spray or apply the cleaning solution onto the rag and not directly onto your guitar or onto the strings of your guitar. 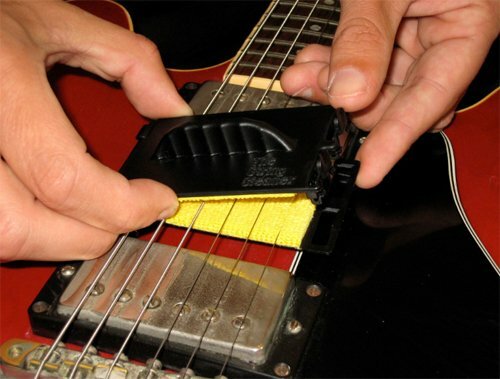 This will ensure that excess cleaning solution doesn’t gather on your guitar and damage your instrument. It’s highly recommended that if you’re cleaning a guitar with nylon strings, use a cloth that is slightly dampened with water to clean your guitar strings. 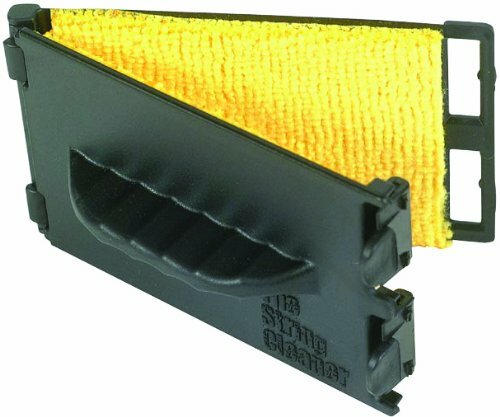 However, if you’re dealing with a guitar with steel strings, there are guitar cleaners that have been specially made for the steel strings, but you don’t have to use these cleaners if you can’t afford them. 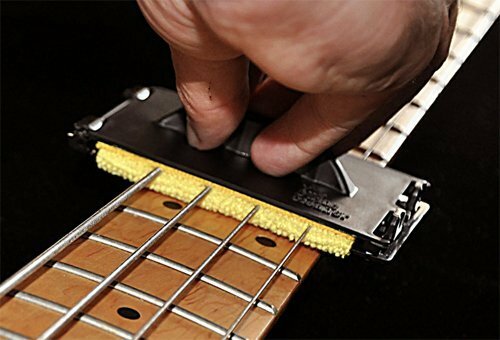 You can use 70%-90% rubbing alcohol can be just as effective as a guitar string cleaner. With your rag damp and ready to clean your guitar strings, slide half of the bottom of the cloth underneath the strings of your guitar near the bridge or the bottom portion of your strings. After that, you’re going to want to fold the rest of the cloth so that the entire cloth covers both sides of the guitar strings. Now, you’re going to slide the folded rags along the length of the strings. You’re going to want to make sure that you go all the way along the stings from the bridge of your guitar all the way up to the nut of your guitar. Make sure that you pay extra attention to the parts of the strings that are located on the fingerboard, as you touch these parts of the strings most often and they’re going to have the most grime on them. Apply downward pressure to clean the tops of the strings, but apply some upward pressure to get the underside of the strings clean as well. It’s extremely important to clean both sides of the strings to ensure that you’re really able to get the most life out your strings as possible, just as it’s important to clean both sides of your teeth. Don’t fret too much if your headstock happens to lift a little off of its mount or if the tuning pegs happen to get messed up a little bit. You can always retune your guitar and that will fix the problem! If you notice that when you’re done cleaning your guitar strings that the strings have changed color a little bit or that there is a grey color on the cloth, don’t worry, it’s a sign that you’re actually cleaning the strings! You can lubricant on your strings to clean them! In order to do this method properly, you’re going to need to figure out what type of guitar strings you have. If you happen to have nylon strings, lubricating your strings isn’t necessary, as nylon strings are corrosion resistant. However, if you have a set of strings that are steel, lubricating your strings will keep them from getting dirty, sticky, and corroded. If you aren’t sure what types of strings you have, look at the package that you bought your strings in and it will tell you. If you don’t have the product packaging anymore, a good way to figure out what type of strings you have is to consider what type of genres your guitar is made to play. If you have an acoustic or a flamenco guitar, which is used to either play classical or folk music, these guitars usually use nylon strings; electric and bass guitars play in blues, rock, country, and pop genres typically have steel strings. Next, you’re going to want to spread lubricant onto a rag or a cloth. Use the opposite side of the cloth that you used in step one to complete this next step. However, if you feel like the cloth is too dirty and the oils from your hands have gotten onto the clean side of the cloth, you can use a new cloth for this step. You’re going to want to use a lubricant that doesn’t contain a petroleum base when you’re cleaning your guitar as petroleum based lubricants have penetrating properties that can damage your guitar over a period of time. You can use GHS Fast Fret or Dunlop Lemon oil to clean your guitar strings or any other product that has been specifically made for guitars. If you’re not looking to spend any money olive oil or baby oil will do the trick. You don’t ever want to apply the lube directly to the strings, as there is great chance that you’re going to get excess grease on the fretboard which is extremely difficult to clean up. Once you have the lubricant on your cloth, run the cloth across the strings of your guitar. Position and fold up the rag the same exact way you did when you removed the grime off of your strings; run the cloth from the bridge of the guitar all the way to the nut of the instrument. You’re going want to apply pressure to both sides of the strings using your fingers. When this is one properly, the strings will be much shinier looking, oily, and smooth feeling on your gingers when you touch them. Make sure that you clean your guitar strings after every time you play them. This is important because your skin produces natural oils that combine with dust and dirt from the environment around you, which is going to stick to the strings of your guitar. While this dirt and grime isn’t extremely noticeble to your eye, it doesn’t mean that it’s not there. By not cleaning your strings after every time you play them, you’re going to cause extra stress to your strings, which I turn is going to shorten the life span of your strings. Cleaning your strings on a regular basis will help to slow down the oxidation process that breaks your strings down faster. A lot of musicians highly recommend that you clean your guitar strings while you’re playing. If you happen to performing in an enviornment that’s dusty, hot, humid, you’re sweating under the lights, or you’re nervous and you’re prone to sweating, it’s a great idea to wipe down your strings during a playing session. Whenever you take a break in between your songs, like when you are getting out your new sheet music or a drink of water, take this time to clean your strings. That way, you won’t have to do as much work on your strings after your performance! Also clean your strings before your sessions, if you feel the need to. If you happen to let your instrument to sit exposed to the open air or it’s been a long time since you’ve played your instrument, you may want to consider wiping down your strings before you use it. This will help to make sure that no dust or dirt has settled onto your strings before you start playing, which will help to prevent the natural oils from your hands to combine with the dust and dirt on your strings. If you’ve never cleaned your guitar strings before, you’ve probably got some questions about the entire process. Don’t worry, we’ve got your back! Q: Will my guitar be hard to play if it’s oily? A: Not necessarily, as many musicians find that playing on oily strings is a lot easier because it’s easier for your hands and fingers to slide across the strings. Q: Can I use coconut oil on my fretboard? A: I would highly recommend that you don’t use coconut oil on your strings or your fretboard, as coconut oil can turn rancid. If you happen to have a fretboard that’s comprised of darker wood, use mineral oil or lemon oil. However, if you have a maple fretboard, don’t use lemon oil. Q: Will a disinfectant damage my guitar strings if I use it to clean my strings? A: You won’t want to use any type of disinfectant such a Lysol or Dettol because your strings are going to rust. Dilute the disinfectant in water and then use paper towels to dab the disinfectant onto your strings. Q: Can I use WD40 on my guitar? A: Don’t ever use WD4O on your guitar, as it is a cleaner and a not a lubricant. 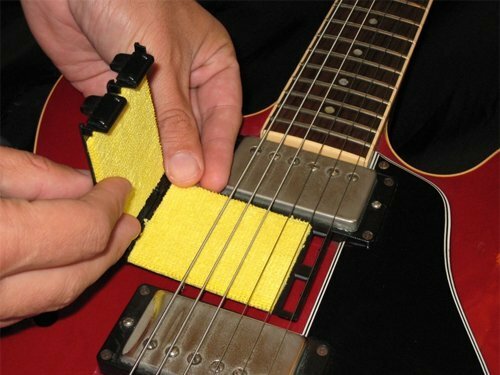 WD40 will either completely ruin your guitar’s fingerboard, which will result in costly repairs. Q: How much pressure should I apply to the strings of my guitar? A: The more gentle you are, the better. If you happen to apply too much pressure to your strings while you’re cleaning, your strings may go out of tune. If this happens, you’re going to need to re-tune your guitar before you go ahead and play it again. Q: What do I do if there’s too much oil on my strings? A: If you happen to decide that the feeling of the oil is greasy and uncomfortable for you to play on, you can take a dry paper towel or cloth, fold it in half, and remove the excess oil from your strings in the same manner that you cleaned them in. Q: Do I have to clean the strings on my acoustic guitar? A: No matter what type of guitar you’re playing, you should perform some type of your strings. This is especially true for your acoustic guitars as if you don’t take care of the strings on your acoustic guitar, the amount of stress that dirty strings place on your guitar can cause cracking in the finish between the bridge ad the end of the body of your guitar. 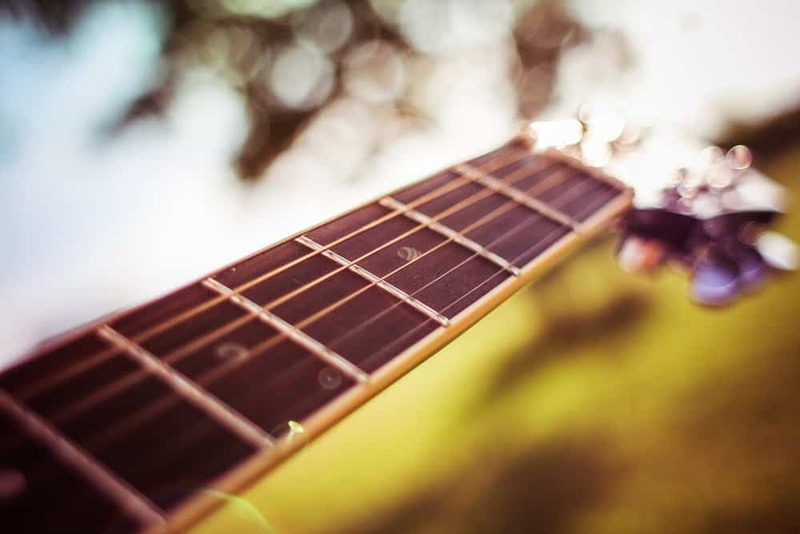 The best way to ensure the longevity of your acoustic guitar is to clean your guitar strings. Q: How often should I clean the body of my guitar? A: It’s recommended that you clean down the body of your guitar on a daily basis if you use your guitar on a daily basis. Unless your manufacturer suggests otherwise, car polished work fine on the lacquered parts of your guitar body, the back of the neck, and headstock of the guitar (while the strings are not on the guitar). 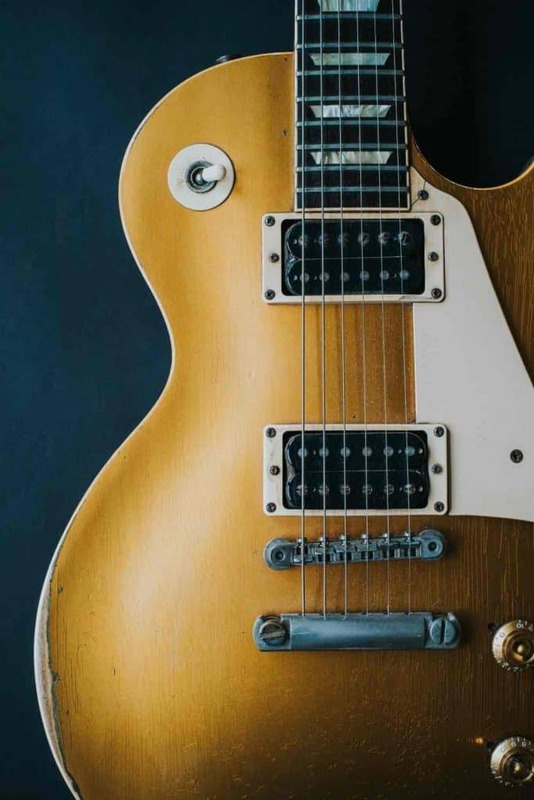 However, if you happen to be cleaning an electric guitar, ensure that you’re not touching the pickups or any of the electronics on your instrument with any type of polish or liquid, as this will ruin the electronics on your instrument. Q: Should I bother to clean the neck of my guitar? A: You’re going to want to use the same cloth that you used on your strings to rub down the neck of your instrument after you use it. Whenever you decide to change your strings, you’re also going to want to clean your fretboard, because you don’t have any strings on the fretboard to interfere with the cleaning process. If you happen to have an unfinished mahogany or a rosewood fretboard, rub steel wool of the finest grade in a circular motion between the frets and then across the entire length of the fretboard, as this will help to quickly loosen up and clean off some build up that is resting on your fingerboard. If you do happen to complete this step, make the time to make sure that you wipe away all of the fibers and the loosened dirt with a clean cleaning cloth once you’re finished. It’s a great habit to get into to put a t-shirt, towel, or a cloth into the sound hole of the instrument and to point the headstock to the floor while you’re using a steel wool, as this will help to ensure that no debris gets into other parts of your instrument. After that, you can rub a fretboard oil on the side of the neck that has the frets to help prevent any build up in the future. Your guitar strings are one of the most important parts of playing your guitar- you can’t play your instrument without any guitar strings! Strings can become extremely dirty very easily, which can lead to a negative impact on the lifespan and the quality of sound that the strings produce. Keeping your guitar strings clean and in optimum condition can help to elongate of the life of your strings!